Writing is Jake’s life. Literally. Jake, you see, is a writer by profession. For thirty years. he’s worked eight hours a day, every day, out of an eight by ten foot office in his apartment. In fact, he writes all the time, even when he’s not actually writing. And he’s got a pretty active social life, too. At least in his mind. There’s his late wife, his wife of late, his young daughter, his older young daughter, his sister, his girlfriend, and—as you may have guessed—his psychiatrist. 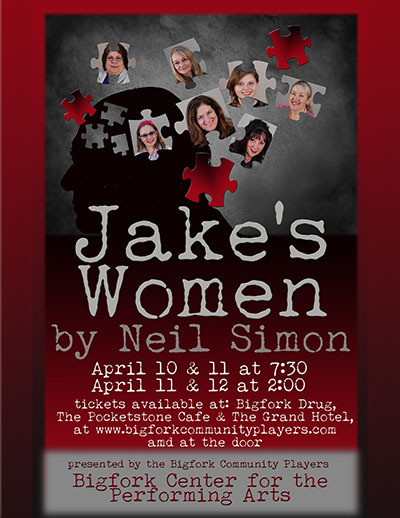 Jake can’t decide whether he’d rather keep the company of the women in his life or the women in his imagination. Unfortunately for Jake, the women in his life are less ambivalent. The time, it seems, has come for Jake to decide between the pleasures of reality and those of imagination. And if it takes a catharsis, a miracle, and a bolt of lightning to make that happen, then so be it. Saturday, April 11, 2:00 p.m. and 7:30 p.m.
Sunday, April 12, 2:00 p.m.